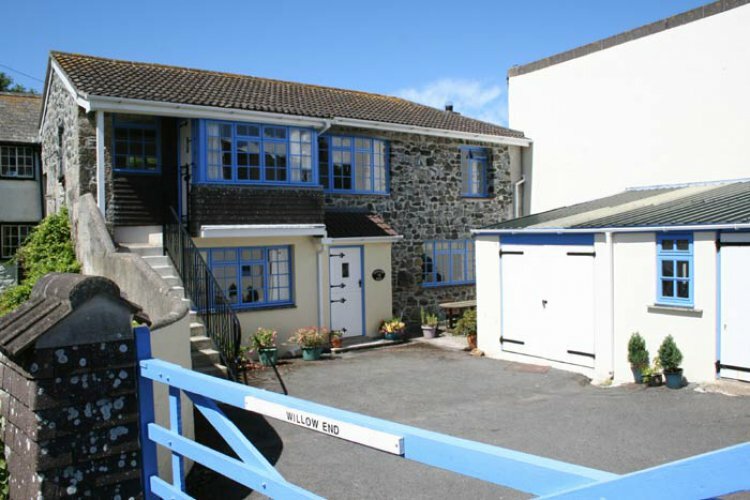 'Willow End' is a spacious reverse level, two bedroom house, tucked away in a quiet position in the centre of the historic village of Mullion. There is off-road parking for two cars and a telephone for incoming calls only. Free Wifi is provided. A ground floor stable door gives entrance to a porch with space for coats and boots. Off the hallway from here are the two bedrooms. Double Room, with 4'6" double bed, bedside tables and lamps, chair, two built-in wardrobes, dressing table and mirror with additional cheval mirror and digital TV with freeview. En suite shower room, fully tiled with thermostatic mixer shower, vanity unit with handbasin and matching toilet, heated towel rail, electric shaver point and extractor fan. Twin Room with two 3' single beds, central bedside table and lamp, built-in wardrobe, chair and chest of drawers. Family bathroom (also housing the washing machine) fully tiled, bath with mixer shower over, handbasin, matching toilet, heated towel rail, shaver point and extractor fan. Stairs lead up to the large, bright Lounge/Diner with two, two-seater sofas and two armchairs, dresser unit, coffee table, 32" Sony flat screen TV with freeview, DVD player, stereo Radio/CD player and feature electric fireplace. Also a large glass topped dining table with four rattan chairs. Off the lounge is a further entrance lobby with coat hanging space, giving alternative access to the property from outside via a flight of steps. Kitchen Breakfast Room with solid oak flooring and cabinets, dishwasher, fridge, freezer, electric oven and hob with extractor over and microwave. Breakfast table with four chairs. Outside is a sunny courtyard with garden furniture and BBQ provided. Willow End is decorated and finished to a very high standard. Rental includes bedlinen, towels, electricity and fully controllable central heating. Regret no pets and no smoking in this property.